Audio-Technica is pleased to announce that Roseville, California-based The Farm Technical Sales & Marketing has been presented with A-T’s prestigious President’s Award, for their work representing Audio-Technica U.S. Accepting the A-T President's Award. Pictured from left to right: Doug Swan, Audio-Technica National Director of Sales & Marketing, Professional Markets; Mike Corvin, The Farm Technical Sales & Marketing Manufacturers Representative; David Lawrence, The Farm Technical Sales & Marketing Manufacturers Representative; John Hood, The Farm Technical Sales & Marketing Principal; Philip Cajka, Audio-Technica President & C.E.O. ; and Justin Rose, The Farm Technical Sales & Marketing Manufacturers Representative.The Farm Principal John Hood accepted the award, which recognizes a leading manufacturer’s representative for outstanding commitment and dedication during the Audio-Technica 2013/2014 fiscal year. 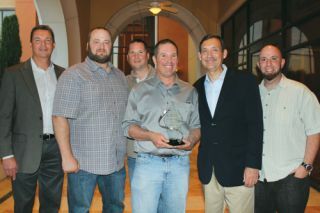 The award was presented by Philip Cajka, Audio-Technica U.S. President and CEO. The A-T President’s Award was presented at a ceremony during the 2014 InfoComm Expo on June 18 in Las Vegas, Nevada. The Farm represents Audio-Technica in the territories comprising Oregon, Washington, Idaho, Montana, Alaska, Northern CA, Northern Nevada and Hawaii.